This is the story of one of the world's great philharmonic societies, told by a distinguished conductor and writer whose command of the subject is nothing short of virtuosic. 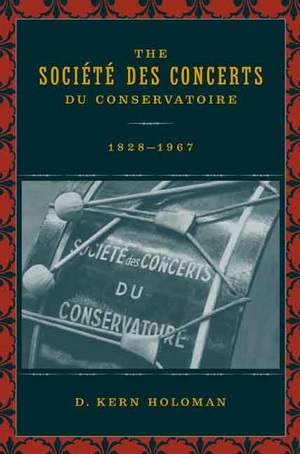 Established in 1828 with roots stretching back to the 1790s, the Société des Concerts du Conservatoire reflected and in many ways encapsulated the development of French culture, and of Western music, in the nineteenth and twentieth centuries. D. Kern Holoman describes how in the 1820s and 1830s the potent forces of democracy, exclusivity, and revolutionary fervor that collided in and around the Conservatoire forged and then tempered an organization as flexible as it was strong. In elegant and spirited prose, accompanied by illustrations and a website with copious further documentation, Holoman chronicles the life of the Société, from its day-to-day operations to its role in creating the canon of orchestral concert music in our culture. A testament to the Société's power and importance, his book is itself a significant contribution to the history of Western music. D. Kern Holoman is Barbara K. Jackson Professor in the Department of Music at the University of California, Davis, where he conducts the UCD Symphony Orchestra. He is the author of Berlioz (1989), Evenings with the Orchestra: A Norton Companion for Concertgoers (1992), and, most recently, of Masterworks: A Musical Discovery (third edition, 2003).